Many are the times we come across retaining walls in our workplaces, schools and homes but we fail to give much thought into them. This only happens when we are in need of one. Retaining walls have a number of uses. Call (916) 473-4001 now for free quotes. Contact (916) 473-4001 now for free estimates. We, a concrete retaining wall contractor, are professionals in this area of expertise. This doesn’t come by mere bragging but by the true works of our hands. More so, concrete has been used as a construction material for decades now. This is due to its unique capabilities. It is strong, long lasting, economical and can be cast on site. This makes it possible for the construction of different designs and shapes. Traditional gravity concrete retaining walls are the oldest type of retaining walls. Moreover, they are still constructed to date. These walls rely on their own weight to support the soil. All our walls are designed to withstand the forces and pressure from the retained soil in order to prevent sliding and overturning. These are steel-reinforced retaining walls. They are the most common concrete retaining walls. Their main parts include a vertical stem and base slab. They are more economical as compared to the gravity walls as they require less construction material. If the wall required is to be used to retain soil exceeding 5 meters in height, counterfort walls will serve the purpose. They have a heel and a toe on their base slabs and counterforts which strengthen the vertical stem. Just as their name suggests, these walls are built using bored piles. Bored pile walls call for a lot of work while stabilizing and strengthening them. Once they are set in place, they are there to stay and will purposely serve you for decades. These walls are anchored into the ground by the use of grouted ties. They can also use cables for additional strength. Where the wall has to be thin but has to hold back a high load like on roads, we use these type of retaining walls. You can decide to have a fountain, fireplace or built in bench on your retaining wall for it is possible with us. We are going to make you wish come true in just a single call. What are you waiting for? 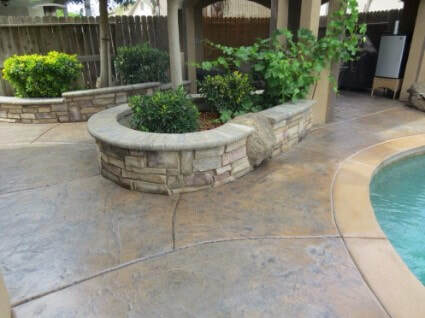 Call (916) 473-4001 today for free quotes from the leading contractors in Rocklin, CA.